WASHINGTON — A Republican congressman told The Flipside that top Republican congressmen and governors have been privately pushing for the party to demand a return to the Articles of Confederation during negotiations over the debt ceiling and the current government shutdown. 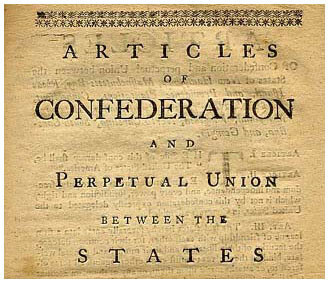 The Articles of Confederation were ratified in 1781 and replaced by the Constitution in 1789 due to widespread federalist and nationalist opposition to the Articles. 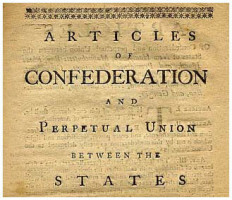 The Articles of Confederation do not contain a president, a Supreme Court, congressional power of taxation, or congressional power to regulate foreign or interstate trade. Such a proposal thus represents a minor increase in the extents of recent Republican demands during negotiations. “Obviously, they’re not advocating that we negotiate for a straight return to the Articles without modification,” said the Republican congressman. “That would be lunacy. They’re obviously going to include amendments making it easier to finance the strongest army in the world, exclusively through sales taxes that everyone with an income higher than a quarter of a million dollars a year will be exempt from if they can get Obama to agree to it – which they probably can, because otherwise the entire global economy will probably collapse,” said the congressman as he puffed on a cigar.